We don’t know how many feral cats there are in the USA. Also stray cats, wandering domestic cats and feral cats are all bundled together. We don’t know what is what. These are “community cats“. This must seriously hamper counting if anyone is actually counting. the presence of animal preying on cats. Depending on the location, anecdotally, I am told that between 10 and 50% of the total cat population taken in by animal control facilities in the United States are feral. That is an interesting statistic albeit a very wide spread. 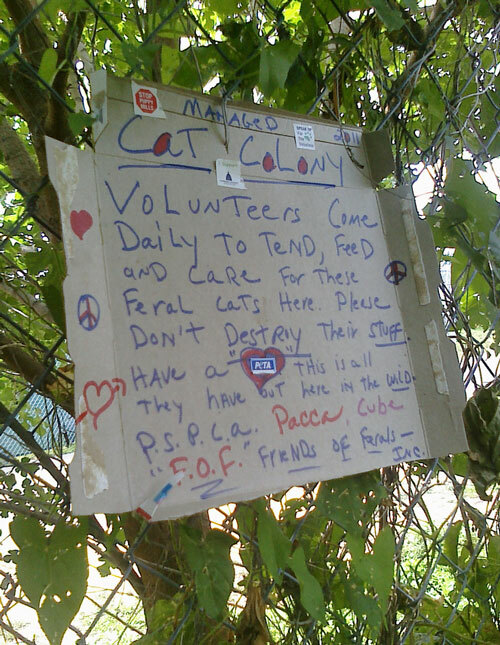 But what it must mean is that between 50 and 90% of the cats taken in by animal control facilities are not feral. That means (1) stray domestic cats and (2) relinquished cats. That seems to be a fair supposition. So, at the top end we seem to have 90% of cats in shelters are domestic cats. I think that should make us think. Because in some shelters 75% of these cats are put down. It is all rather depressing and odd because it goes on year in and year out. In one study in one place in 1997, 63% of cats entering a shelter were “impounded strays”. A number of reliable studies conducted in the west, south and northest United States have shown that between 9 and 22% of households feed free-roaming cats that they don’t own. So up to about a quarter of households feed feral and stray cats out of the kindness of their hearts. That indicates a sympathy for stray and feral cats from a good section of the population. I would think that any law makers that are considering laws concerning strays and ferals should keep this in mind. As mentioned in the opening paragraph we don’t know the number of strays and ferals. Figures are estimates. Some experts suggest that the number of free-roaming cats equals the number of owned cats. There are an estimated 80 million domestic cats (owned cats). Other experts believe the figure to be between 25 and 60 million (at 1998 – Patronek). This figure seems to be badly out of date. The climate has an impact on numbers because warmer weather allows females to produce two to three litters in the year added to which milder winters makes it easier for a full-time outdoor cat to survive (reduced mortality). The primary factor dictating the dispersion of female free-roaming cats is the availability of food. Secondary factors are “our resources” such as availability of shelter, resting places and competition with other animals. For male cats the another limiting resource with respect to group living is the availability of female cats. This entry was posted in Feral Cats, Human to cat relationship, Moggie, Stray Cats and tagged Community Cats, feral cats, free-roaming cats USA by Michael Broad. Bookmark the permalink. A friend of mine just flew from Toronto to Sacramento CA. He went to visit a friend of his. He’s not into cats but he knows how much I am so he reported to me something he found upon arrival at his friends. The neighbours had recently moved out and had left a cat behind. This cat is apparently so sweet and desperate for attention its tragically sad even for them who don’t care for cats. Terry, my friend, is insisting on buying some food for the cat (he has a name I forgot, sorry about that) – his friend, who lives next door is trying to avoid contact and is ushering the cat away because he doesn’t want the cat to be attached to him, and he feels quite bad for the cat too though. He says the neighbours justified leaving the cat behind since it was never their cat, just a stray who they took in. This cat sounds very sweet and domesticated. Whenever they arrive home he is there and meows at them and wants nothing but cuddles and more cuddles. They saw him hunting (interestingly they feel that because they saw him hunting its therefore not so bad to leave him alone – just to give you an idea of the average mindset of nice non-cat people who sort of care) – although I don’t think they saw him catch anything. Of course when on skype with me I urged them both to help him, feed him, give him cuddles and eventually take him in – but the guy lives on the 1st floor and this cat is clearly an outdoor cat and was in the beginning. I also made it very clear that under no circumstances should they call animal control and if they see animal control to bring him in because he will be killed probably otherwise. Its not so cold there, but when I was in that area it was very cold, in San Fransisco, so I am not sure but I think it will at some point get cold there. Still, there are colder places this little boy cat could be so at least there’s that. The only thing – and its a huge thing – that bothers me about this story is that if this cat is so so extremely affectionate, how could they just leave him behind even if he wasn’t theirs to begin with? Hadn’t he sort of become theirs by virtue of the relationship and feeding and the fact he came in their house. I have to verify that he went inside but I think he did. I think its just kind of cold hearted to abandon this little guy who had become part of their family clearly. I guess they didn’t see it that way. I have written and asked for an update on how he is and if they did get him food in the end. No reply yet but I will get one for sure. I would take this cat in a flash if I were there (of course 🙂 )- but my friends friend was never a cat person, he just feels he is on the sidelines and feels nonetheless bad for the cat. I’ll relate my other comment to the article more clearly. What kind of community cat is he? What statistic would he end up being part of if found by animal control? Would he get scared and start acting totally feral if caught even though he is a nice nice boy who craves affection? With situations like this it’s impossible for animal control to have near accurate statistics. Another huge question I have – is he neutered? I will ask. If not then there must be a colony nearby. I would ask these questions. It seems like a good case study. At least it’s California, where I think people are generally more likely to be nice to a stray (?) cat. Hi Marc. I find your comment extremely useful and it is an excellent example of the muddied area of distinguishing stray cats from feral cats and from recently abandoned domestic cat etc. Your story really encapsulates all there is to know about people failing to act responsibly in relation to cats and what to do about it. The neighbours, as far as I am concerned, have accepted responsibility towards this cat. The fact that they cared for him made him dependent on them as a domestic cat. Surely that creates an obligation to at least deal with the situation of moving away in a more responsible manner? You make a good point. If the neighbours had put him into a shelter he could have been killed. This is where I find the concept of “shelters” strange. People should have the confidence to place a cat into a shelter knowing that the cat will be sheltered (protected). I think this cat was a true community cat: a domesticated but with no real home. What could the people moving away have done better? I know it is difficult but it would be nice to think that they could have made an effort to find a home for him. They could have taken on that responsibility. Or taken him with them if that was practical. The trouble is that in countless homes the relationship between cat and human is quite loose. It is not a close relationship which binds the parties together. It is a relationship that is easily broken. Only people who can form a close relationship should keep a domestic cat because it ensure they will take responsibility throughout the life of the cat.